EN-EL12 battery 1500 mAh for Nikon Coolpix S6000 S6100 S6200 S6300 S8200 S9200 Battery EN-EL3e ENEL3E for Nikon D100 D200 D300 D3... New Full Decoded 2600mAh EN-EL18 ENEL18 Battery fo... For NIKON EN-EL21 Camera Battery Nikon 1 V2 D-SLR ... EN-EL12 is a rechargeable Li-ion battery providing 3.7v and ultra high capacity of 1500 mAh to select Nikon COOLPIX digital cameras. compatibility: Nikon Coolpix AW100 Nikon Coolpix AW110 Nikon Coolpix P300, Coolpix P300 Nikon Coolpix P310, Coolpix P310 Nikon Coolpix P330, Coolpix P330 Nikon Coolpix S31, Nikon S31 Nikon Coolpix S1000pj, Coolpix S1000pj Nikon Coolpix S1100pj, Coolpix S1100pj. COOLPIX P5100 COOLPIX P520. COOLPIX P510. COOLPIX P500. COOLPIX P3. COOLPIX P4. COOLPIX P100. COOLPIX P530. COOLPIX P6000. S9050, S9100, S9200, S9300, S9400, S9500, S9600, S9700,S9700s. S6000 S6100 S6300. S8000 S8100 S8200. Nikon Coolpix Series Capacity: 1300 mAh. Nikon EN-EL12. This Battery Can be Compatible With Output: DC 4.2V === 600 mA. Nikon: Coolpix S610, Coolpix S620, Coolpix S630, Coolpix S640, Coolpix S70, Coolpix S710, Coolpix S6000, Coolpix S8000, Coolpix S8100,Coolpix s8200, Coolpix S910, Coolpix S9100, Coolpix S1000pj, Coolpix S1100pj. Provides consistent power, even in colder conditions. Genuine Nikon battery. INOV8 BATTERY NIKON EN-EL12. Price is for 1x INOV8 EN-EL12. Nikon Coolpix S70, S80. Nikon Coolpix S1000pj ,S1100pj, S1200pj. Nikon Coolpix S610, S610C, S620, S630, S640, S710, S800C. COOLPIX AW110 AW120 P330 P340 S9500 S9600 S9700 S31. COOLPIX AW100. COOLPIX AW110. Coolpix S6000. Coolpix S8000. COOLPIX S9900. COOLPIX P340. COOLPIX P330. NIKON lithium ion battery pack EN-EL12. Condition is Used. Dispatched with Royal Mail 1st Class. INPUT: AC 100 ~ 240V, 50 ~ 60Hz 0.25A. Overload protection. D3100 D3200 D3300 D3400 D5100 D5200 D5300 D5500 D5600 P7000 P7100 P7700 P7800. Compatible With. Nikon Coolpix P300 P310 P330 P340 P3000. Nikon Coolpix S31 S70 S610 S620 S630 S640 S800c. Nikon Coolpix S1000pj S1100pj S1200pj. Nikon Coolpix S6000 S6100 S6150 S6200 S6300 S8000 S8100 S8200 S9050 S9100 S9200 S9300 S9400 S9500 S9600 S9700 S9900. Duracell's products are designed to give you maximum power. Whatever your power needs, you can take more photos with Duracell. Specification Fits Nikon CoolPix AW100, P300, P310, S70, S610, S630, S640, S710, S800, S1000pj, S1100pj, S1200pj, S6000, S6100, S8000, S8100, S8200, S9100, S9200, S9300. COOLPIX S9400 Red / COOLPIX S9900 Black / COOLPIX S31 Yellow. COOLPIX AW120 Orange / COOLPIX AW120 Blue / COOLPIX AW120 Black. COOLPIX S9700 Black / COOLPIX AW120 Camouflage. COOLPIX A900 Black / COOLPIX AW130 Black / COOLPIX S9100 SILVER. Replaces the Nikon EN-EL12 Li-ion Battery. Battery Specs: 3.7V 1000mAh. COOLPIX AW100, COOLPIX AW120, COOLPIX AW130, COOLPIX P300, COOLPIX P310, COOLPIX P330, COOLPIX P340, COOLPIX S1000pj, COOLPIX S1100pj, COOLPIX S1200pj, COOLPIX S31, COOLPIX S610, COOLPIX S610c, COOLPIX S6100, COOLPIX S6150, COOLPIX S620, COOLPIX S6200, COOLPIX S630, COOLPIX S6300, COOLPIX S640, COOLPIX S70, COOLPIX S710, COOLPIX S800c, COOLPIX S8000, COOLPIX S8100, COOLPIX S8200, COOLPIX S9100, COOLPIX S9300, COOLPIX S9400, COOLPIX S9500, COOLPIX S9600, COOLPIX S9700, COOLPIX S9900. Fit to the device models:NIKON Coolpix AW100s, Coolpix S1000pj, Coolpix S6150. RoHS Approved for toxic free. Compatible with the battery part numbers:EN-EL12. Replaces Nikon EN-EL12. Duracell's products are designed to give you maximum power. Whatever your power needs, it will last longer with Duracell. Duracell has been powering the needs of people around the world for more than 40 years. This sale is for a new Top-Max EN-EL12 Battery 1150 mAh for for Nikon Coolpix S9100 S8200 S6200 S6150 as seen in the pictures. make Supersized seem small. High capacity - 1000mAh. - up to 1000 cycles. Introduction: 100% Brand New and High quality. Compatible with original manufacturer equipments and chargers. Rechargeable Lithium-Ion battery pack, NO memory effect so that you can charge battery at anytime. Model NO. 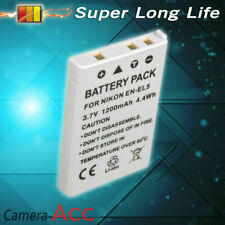 : EN-EL12 Battery Type: Li-ion Capacity: 1400mAh Voltage: 3. Nikon Coolpix S6300, Coolpix S6300. Nikon Coolpix S6200, Coolpix S6200. Nikon Coolpix S6100, Coolpix S6100. Nikon Coolpix S6000, Coolpix S6000. Nikon Coolpix P300, Coolpix P300. Nikon Coolpix P310, Coolpix P310. COOLPIX AW100, AW110, AW120. COOLPIX S9050, S9100, S9200, S9300, S9400, S9500, S9600, S9700, S9900. COOLPIX P300, P310, P330, P340. Coolpix S8000, S8100, S8200. NIKON EL-EN12. Genuine Nikon accessory. Battery Technology: Lithium Ion. Battery Capacity: 1Ah. Product Contents: Battery only. Country of Origin: China. Qumox EN-EL12 is a rechargeable Li-ion battery providing 3.7v and ultra high capacity of 1500 mAh to select Nikon COOLPIX digital cameras. compatibility: . Nikon: Coolpix S610, Coolpix S620, Coolpix S630, Coolpix S640. Coolpix S70, Coolpix S710, Coolpix S6000, Coolpix S8000, Coolpix S8100. Nikon EN-EL12. 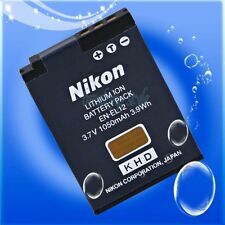 1 x Genuine Original high quality Nikon EN-EL12 Li-ion Battery. Our products are security marked to stop fraud. At this point, the item will be re-listed. For outside the UK mainland Cash / Card. If Your Order Does Not Arrive. Nikon Coolpix S1100. Nikon Coolpix S1000pj. Nikon Coolpix S610. Nikon Coolpix S610C. Nikon Coolpix S620. Nikon Coolpix S630. Nikon Coolpix S710. Nikon Coolpix S80. Compatible with Nikon ENEL12 EN-EL12 MH65 MH-65. Series of safety assets increase charging stability and provide protection from short-circuit. Original Green Cell® Adapter. Advanced safety features. Fit to the device models:NIKON Coolpix S610, Coolpix S610c, Coolpix S710, Coolpix S640, Coolpix S620, Coolpix S630, Coolpix S1000pj, Coolpix S6000, Coolpix S8000, Coolpix S1000pj Projector, Coolpix S9300, Coolpix S9200, Coolpix AW100, Coolpix AW100s, Coolpix P300, Coolpix P310, Coolpix S1000pj, Coolpix S1100pj, Coolpix S1200pj, Coolpix S6000, Coolpix S6100, Coolpix S6200, Coolpix S6300, Coolpix S8000, Coolpix S8100, Coolpix S8200, Coolpix S9100, Coolpix S640, Coolpix S70. Fit to the device models:NIKON Coolpix AW100s, Coolpix S1000pj, Coolpix S6150. Compatible with the battery part numbers:EN-EL12. 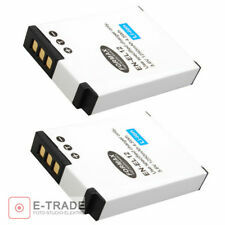 Nikon EN-EL12 original battery EL12 battery S9400 S8000 S8100 S9200 S9500. COOLPIX A900. COOLPIX:AW130S/AW120S/AW100S/Aw110sP300/P310/P330/P340S1000j/S1100pj/S1200pjS31/S70/S610/S610c/S620/S630/S640/S710S6000/S6100/S6150/S6200/S6300S8000/S800C/S8100/S8200S9050/S9100/S9200/S9300/S9400/S9500/S9600/69700s/S9900s. Nikon: CoolPix AW120, P330, P340, S31, S9050, S9200, S9400, S9500, S9600, S9700, AW100, AW110, P300, P310, S100, S1000pj, S1100pj, S1200pj, S610 / S610c, S6100, S620, S6200, S630, S6300, S640, S70, S710, S8000, S800c, S8100, S8200, S9100, S9300. Nikon Coolpix S800c, Coolpix S800c. Nikon Coolpix S1000pj, Coolpix S1000pj. Nikon Coolpix S6150, Coolpix S6150. Nikon Coolpix S710, Coolpix S710. Nikon Coolpix S630, Coolpix S630. Nikon EN-EL12 ENEL12 Coolpix A900 AW100 AW100s AW110 AW110s AW120. NIKON Coolpix S610 S610c S710 S630 S620 S70 S640 S1000pj S6000 S8000. Nikon EN-EL12 ENEL12. AC/DC adapter Car adapter Battery Type : Li-ion. Nikon EN-EL12 ENEL12 Coolpix A900 AW100 AW100s AW110 AW110s AW120. Nikon Coolpix AW130. Nikon Coolpix AW110. Coolpix A900 AW100 AW100s AW110 AW110s AW120. Nikon Coolpix AW100. Nikon Coolpix P300, Coolpix P300. Compatible with: Nikon COOLPIX AW100, AW110, AW120, AW130, P300, P310, P330, P340, S31, S70, S610, S610c, S620, S630, S640, S710, S800c, S1000pj, S1100pj, S1200pj, S6000, S6100, S6150, S6200, S6300, S8000, S8100, S8200, S9050, S9100, S9200, S9300, S9400, S9500, S9600, S9700, S9900. 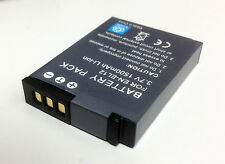 Nikon EN-EL12 Li-ion Battery. Nikon CoolPix S620. Nikon CoolPix S630. Nikon CoolPix S610c/S. Nikon CoolPix 1000pj. Nikon Coolpix S8100. Nikon Coolpix S610. Nikon Coolpix S710. Nikon Coolpix S630. Nikon Coolpix S1000pj. Nikon Coolpix S610C. Nikon Coolpix S620. Nikon Coolpix S1100. Nikon Coolpix P330, Coolpix P330. Nikon Coolpix S31, Nikon S31. Nikon Coolpix P310, Coolpix P310. Nikon Coolpix P300, Coolpix P300. Nikon Coolpix S1000pj, Coolpix S1000pj. Nikon Coolpix S1100pj, Coolpix S1100pj. S6100 S8000 S8100 S8200 S9100 S9200 S31 S6300 S800C S9050 S9400. 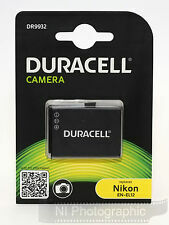 Fit for:Nikon Coolpix Series Battery:NIKON EN-EL12. Smart LED charging status indicator. 1 x MINI USB Cable.